Though analysts have long forecast the withering of this mature field [see this 2004 EnergyBulletin post, for example], a rapid demise would pose serious challenges for the world's No. 5 oil producer. The oil field has supplied the bulk of Mexico's oil riches for the last quarter of a century, and petroleum revenue funds more than a third of federal spending. "Unfortunately, the era of low-hanging fruit … has really run its course," said Herbert, co-head of research at Simmons & Co. International, a Houston-based energy investment bank. He put the odds of finding another field the size of Cantarell in Mexico or anywhere else at "slim and none." Other studies aren't so optimistic. Seawater is threatening to swamp the wells of Cantarell as the field's pressure diminishes, a debilitating symptom of old age that makes it tougher to extract the remaining oil. Leaked internal reports of Pemex's own worst-case scenarios published in Mexican newspapers show production plummeting to about 520,000 barrels a day by the end of 2008 — a 71% free-fall from May levels in less than three years. Some of the most promising potential reserves lie in the deep waters of the Gulf of Mexico. But that's an expensive undertaking for which Pemex lacks the technical expertise, funding and, perhaps most important — time — to bring new production along fast enough to offset Cantarell's descent. The fall of Cantrell will tighten another notch in oil's already snug supply-side belt. With rising demand and supply from its friendly southern neighbor falling, the US will find itself competing ever more heavily for oil that's increasingly sourced in the Middle East. The US gets more oil from the Cantrell complex alone than it now gets from Iraq. This will certainly change if Cantarell's decline follows the path described above. 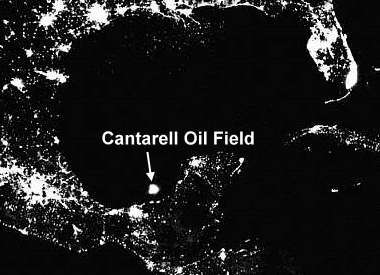 And as the graphic above illustrates, the kind of decline occuring at Mexico's Cantarell field is symptomatic of the world's aging giants: all of the world's top three oil fields - Saudi Arabia's Gawar field (the world's largest), Kuwait's Burgan field (see previous post) and Mexico's Cantarell - are at or past their peak, and it's highly unlikely that similarly large fields will be discovered to replace these 'crown jewels' of the oil industry.